This volume in the very popular Secrets Series® is back in an exciting, updated, and completely redesigned 3rd Edition. 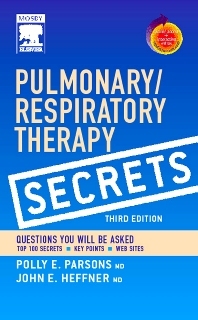 A new, two-color page layout, a more portable size, and a list of the "Top 100 Secrets" in pulmonary medicine help you better meet the challenges you face daily. You will still find all of the features you have come to rely on in the Secrets Series—a questions- and answer-format, lists, mnemonics, tables, and an informal tone that make reference fast and easy. No matter what questions arise in practice or while preparing for boards, this 3rd edition has the answers—in print and online.